One of the rooms I am determined to renovate this year is the second bathroom. I feel like it's a good starting place because it's the smallest room in the house. I'm not the greatest at guessing size, but I would guess it's about a 5' x 7' room. That makes this room about a whopping 35 square feet - maybe 40 square feet on a good day. This poor hardworking room has to serve our entire household of 5. 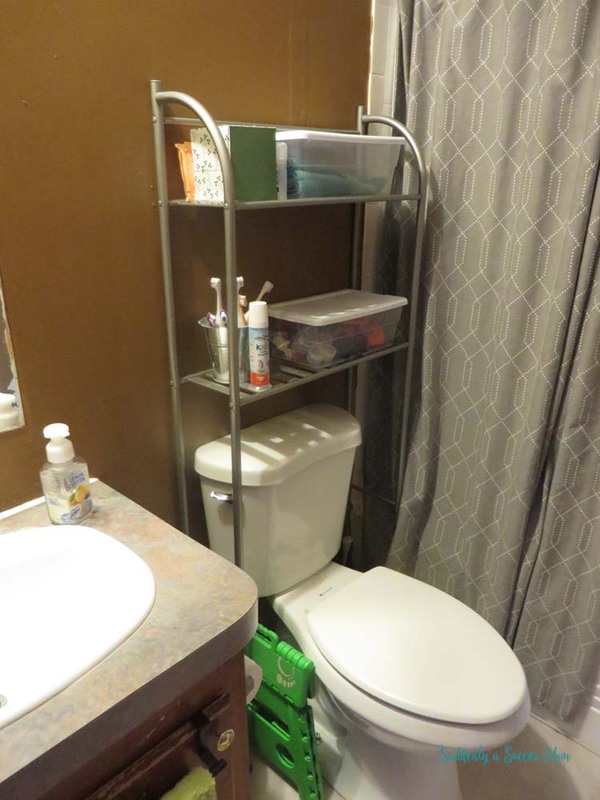 All three kids use this as their primary bathroom, and Justin and I use it more than we use our bathroom during the day just because it's more centrally-located to the rest of our house. Plus, once we replaced the shower faucet I got a bug, and now I really want to turn this room into something awesome. These light fixtures are gorgeous! I love the drawers in the vanity, because in the bathroom I think drawers are more useful storage than the big open space a cabinet provides. The color scheme is beautiful, and I could write love poems to that faucet! 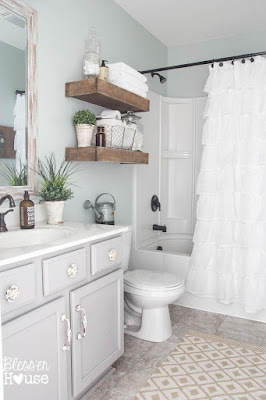 I'm loving the floating shelves above the commode. 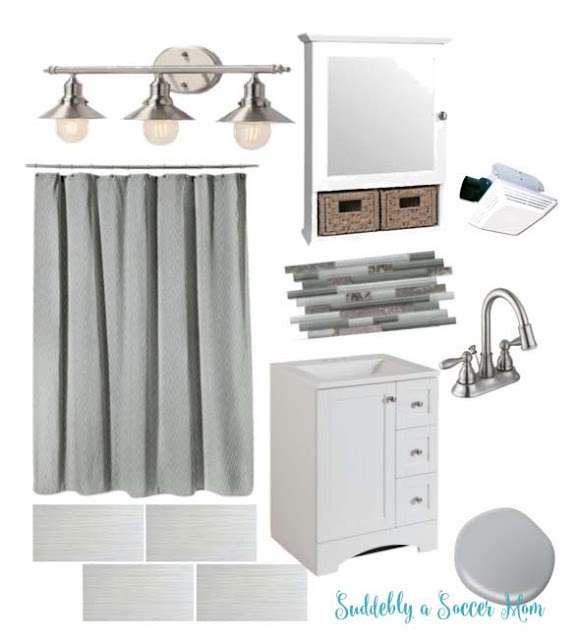 And the ORB fixtures, and the vanity hardware, and the mirror and essentially just the whole darn thing. Clearly I'm loving the gray and white thing. Gray is my love language. In my world, there is no such thing as too much gray. And since this bathroom is shared I want to keep it neutral so everyone loves it. It's also my plan to keep it light and bright to make the space appear a little larger. Most importantly, I want to add as much organization as possible. We've added this hideously ugly shelf as a temporary measure to add some storage. The plastic shoe bin on top stores the kids' washcloths. The shelf below has dental care supplies and a second plastic shoe box that holds Baby Girl's hair supplies, including a dwindling amount of hair bows. Where do all of the hair bows go? 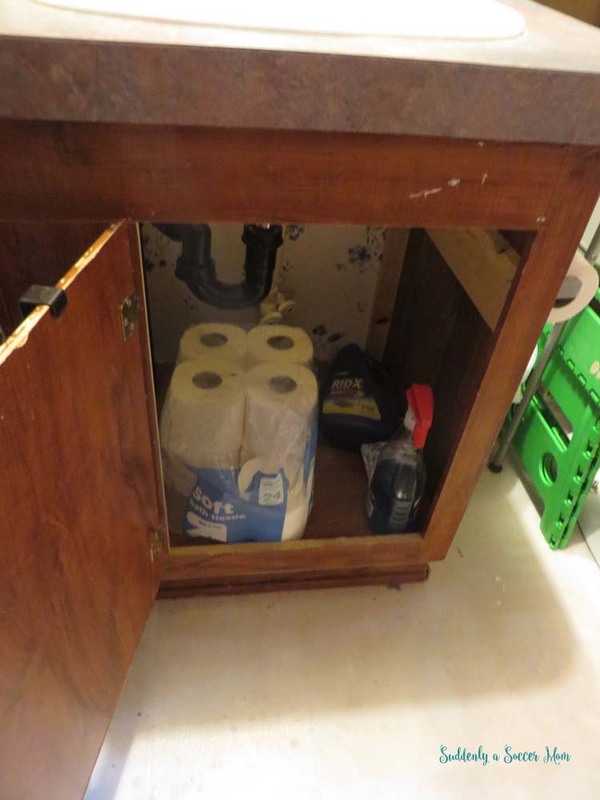 And some useless storage under the sink! 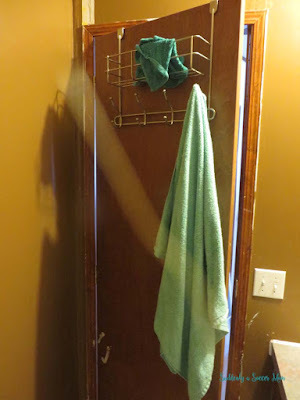 Extra TP, cleaning supplies, and a lot of dead space. Moving on! This hook we have hanging on the back of the door is pretty gosh darn convenient. 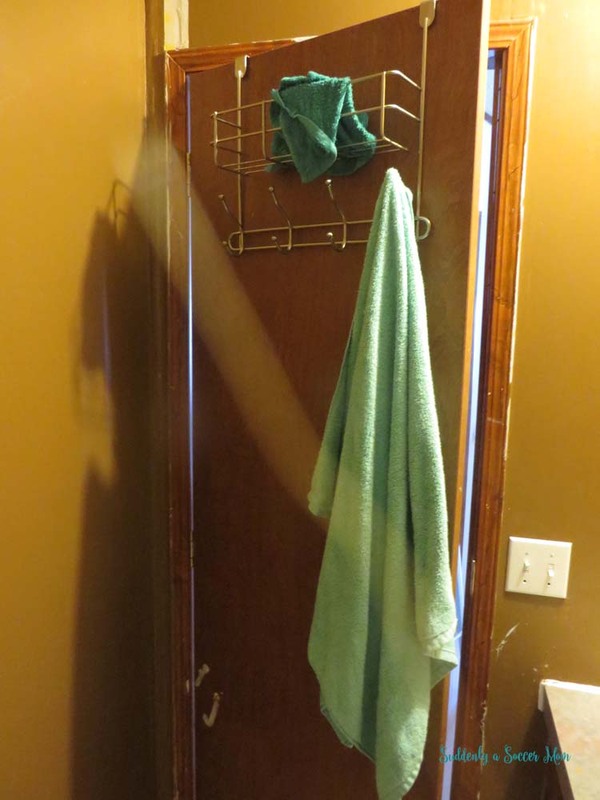 It's easy enough to hang each kid's towel. Deputy Dad likes to toss the used washcloths up in the little basket, then neglect to tell me when he tosses one up there so it's like a fun game to walk in there and discover one. Or three. But who's counting? Ready to see what I want to turn this bathroom into? Ahhh!! 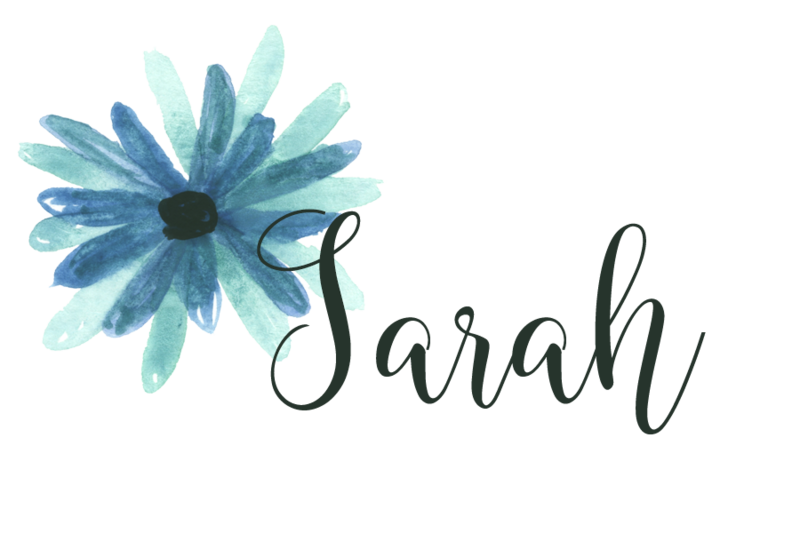 I'm so excited to put this plan in to action. The light fixture is so dreamy to me, and I want the lighted vent fan to provide that much more light into the room. I feel like, especially in a bathroom where we have a little girly girl growing up, there can't be such a thing as too much light. I'm going to stick with the shower curtain that's already in there, but I can't find it online anymore so I stuck something similar in my mood board. 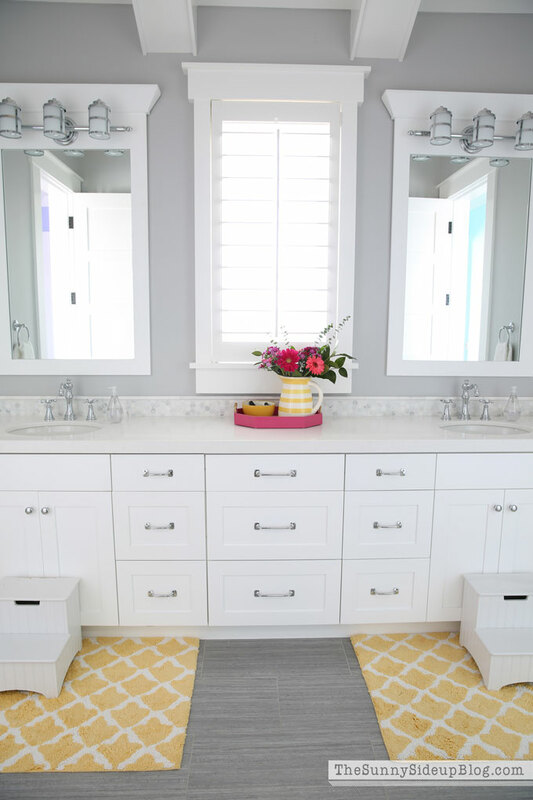 The medicine cabinet and the vanity help to offer a ton of extra storage (those baskets are going to be perfect for hair bows). I'm planning on just a touch of the tile along the back wall to add a little bit of a little something-something, you know? I want the extra high arched faucet in there. I'm not sure why, but I do so I'm rolling with it. The floor tiles from Surplus Warehouse are so pretty in person. I want to run them length-wise to make the room appear a little longer. For the paint color, my beloved French Silver is making another comeback. I'm hoping all told, I should be able to renovate this entire room for around $500. 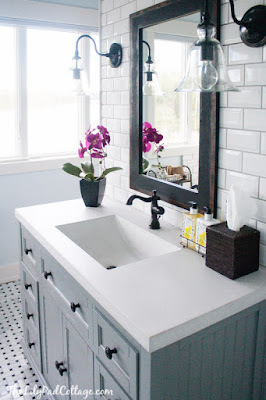 The vanity is about half of that budget, but everything else is really affordable. I'm most excited about that light since it rings up at a whopping $70! Can you believe it?!? My plan is to save up the entire amount I need to re-do the bathroom, then do it all in one fell swoop a la the One Room Challenge. I figure if we have everything sitting around, I'll be more motivated to get it all done. And I just can't wait for it to be done! Now to start saving up those pennies. I've got this project in priority one status though, so hopefully it shouldn't take too long! !